In Rain World you play as a small slugcat who gets separated from its’ family after a devastating flood. Awakening alone you must venture out looking for food to survive while dealing with deadly floods and wildlife that would like to make you its’ lunch. Will you be able to guide your little slugcat to safety before it becomes victim to the harsh wilderness that it finds itself in. 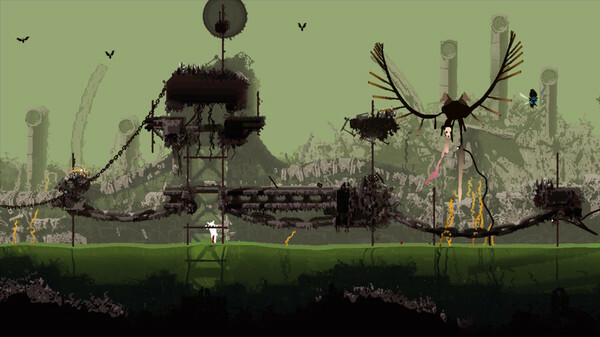 When I first heard of Rain World I was intrigued by the game’s premise of combining a platformer with a survival game. The survival genre has become quite popular recently but I have never really seen a game that had blended survival mechanics with a 2D platformer. While a lot of survival games have you gathering resources in order to build up your base, Rain World is a survival game in a more primal way. In Rain World you are a mostly defenseless creature that is just trying to survive on a day by day basis as it tries to find its’ family. This makes Rain World feel different than any other survival game that I have ever played. I think the most impressive part of Rain World is the fact that it truly feels like you are part of a much larger ecosystem. All of the creatures in the world are their own separate entities. Each creature makes its’ own decisions on what it wants to do as it tries to hunt down food and take shelter from the rain. The creatures don’t have predetermined routes that you can figure out and avoid since they will show up in new rooms every day. This also forces you to explore since you can’t find food in the same locations every day. While this mechanic creates some issues which I will address later, it is a really cool mechanic. It really makes you feel like you are part of something that is much larger than yourself. This ecosystem really benefits the game’s theme of you being a small creature in a hostile environment just trying to survive. The slugcat is cute but nothing else about the game is cute. This world is hostile and it wants to kill you. Dangers lie everywhere and you will be dying a lot. This makes the game really feel like you are fighting for your survival as an insignificant creature in a much larger world. Rain World has done one of the best jobs I have ever seen of making you feel like you are truly fighting for your own survival. While the game’s artwork is not going to appeal to everyone, I really liked it. The slugcat itself is so cute that it is truly sad every time you see your slugcat die in the game. The enemy creatures in general are also well designed. What is most interesting about the characters is how they move. Their movements are controlled by physics which leads to the occasional hiccup but most of the movement feels really smooth. The environments themselves are mostly abandoned wastelands but they show quite a bit of detail. The environments do have the occasional issue where it is hard to tell what is part of the background and what is part of the foreground that you can jump on. All of these elements combine into an experience that is different than any I have played recently. With all those positives it is such a shame that the game is ruined by the game’s difficulty and lack of direction. Rain World is such an interesting idea and I would have loved to complete the game. In its’ current state though it is just not worth it. I had fun with the game but I just don’t think it is worth dying over and over again to complete the game. I don’t mind being challenged but when the game is so hard that it is hard to make any actual progress, the game becomes more frustrating than fun. Let’s start with the beginning of the game. When I first started playing Rain World I struggled a little because I was too aggressive. I was too focused on just making it to the next level/world that I was careless. I attribute some of this to being too aggressive but some of the blame goes to the game for not really explaining what you are supposed to do in the game. While the game gives you a little yellow creature that gives you some introductory tips on how to play the game, these come far and few between. The game doesn’t even explain to you that you need to reach a certain level before you can even reach the next section of the game. You will eventually figure it out but this is the perfect example of how the game doesn’t give players nearly enough direction in the game. You helper creature tries to help lead you to safe spaces but it is not helpful because you don’t even know what it is trying to tell you most of the time and it is constantly moving so you don’t even know where it is half of the time. Outside of being taught the very basics of the game you are basically left to teach yourself how to play the game. So after I learned the basics after dying several times, I proceeded to make it to the second world/level. When I reached the world I now knew that I had to take it slow and upgrade my level before even looking for the next entrance. So I spent several in-game days getting enough food to upgrade to the highest available level. I then ventured out looking for the entrance to the next location. Due to no help from my “friend” I wandered around and around not being able to find the entrance to the next location. The second world really shows you in simple terms that this is not a forgiving world. There are creatures all over the place that want to kill you. While looking for the entrance to the next location I died several times as I was surrounded by enemies with no possible way to escape. While it is cool that all of the creatures have their own free will, it leads to the game being totally unfair at times when all of the enemies gang up on you at the same time. The few times I wasn’t surrounded I ended up drowning due to not being able to find a safe zone before the rain began. While I can understand why the enemies are difficult, the most frustrating part of the game was trying to figure out where I was supposed to go. The yellow creature is supposed to help lead you to safe zones and yet it rarely did for me. The yellow creature just jumps all over the place providing very little actual help. Basically you need to explore the whole world hoping to run into the next entrance. The game really needed to find some way to make it easier to figure out where you are supposed to go next. I know the game wants you to just explore but it is hard exploring the environment while there are things ready to kill you around every corner. The final issue that leads to the game’s difficulty is the game’s self imposed time limit. If you don’t find shelter in time you will be killed by the downpour of rain. I think the rain mechanic is kind of cool as it is quite tense trying to get to shelter in time. The rain mechanic just adds even more difficulty to the game. The game doesn’t give you enough time in each day to find food and still explore without making it hard to get back to your shelter in time. Then add in the fact that you either have to spend long times waiting for enemy creatures to move and you basically have to choose whether you want to try and outrun the enemy or drown. With the game giving you a time limit it kind of forces you to be aggressive where you are better off being cautious. This difficulty leads to a never ending loop where you gain levels just to die a bunch and have to regain them all over again. I don’t mind a punishment for failing but since a lot of deaths are due to getting lost or surrounded by enemies, the punishment is too harsh in my opinion. Losing a level each time you die basically forces you to spend most of your time maintaining your level and then hoping to find the entrance to the next area before you die and begin losing all of your levels again. I know that Rain World was meant to be a hard game and I have no problem with the game keeping the current difficulty in the game. I think Rain World could benefit from an “easy mode” though where you wouldn’t lose your levels when you died. If you didn’t lose your lives every time you died, death wouldn’t be so frustrating since you wouldn’t have to keep regaining lost levels. Eventually Rain World became too much and I gave up on it. I usually try to completely finish a game before reviewing it but it just got to the point where it wasn’t worth it anymore. It would have taken forever to complete the game and the review wouldn’t have been timely at all. The game also would have frustrated me to the point where I no longer would have had fun with it. This really disappointed me because I really wanted to keep playing Rain World to see how the game would evolve. Hopefully the game will add an easier difficulty and work on giving players more direction since I would really like to come back and complete the game. Rain World is a very interesting game. There is so much that I like about the game. The gameplay and atmosphere are so unique and could have made for a great game. It truly feels like you are a small mostly defenseless animal in a very deadly ecosystem. This is a game that I really want to keep playing and finish. The problem is that it is just too unforgiving to the player. The game gives you very little direction and basically tasks you with teaching yourself how to play the game. You will die constantly and you will lose the progress you have already made. Rain World has all the makings of a fantastic game but you need to be willing to go through a lot of pain to be able to experience it. If you can’t handle games with unbearable difficulty, Rain World will not be for you at this time. If the developers add an easier difficulty I would have no problem recommending the game to anyone who is intrigued by the concept because Rain World is a really good game outside of the difficulty. At this stage though I can only recommend Rain World to people who can stand or even embrace the extreme difficulty. We at Geeky Hobbies would like to thank Videocult and Adult Swim Games for the review copy of Rain World used for this review. Other than receiving a free copy of the game to review, we at Geeky Hobbies received no other compensation for this review. A truly innovative take on the survival game. Makes you feel like a small part of a much larger ecosystem. Fails to give you enough direction most of the time.